Showcase your gaming battlestations here. Show off your specifications and hardware configuration so the plebs of the lower gaming classes can look at with envy! You can also use this thread to show off new PC/AV purchases and peripherals. You can choose to upload your pictures using Gamespot, or provide links to Imgur/flickr. Please do *not* quote more than two (2) pictures at once. Use common sense when it comes to quoting as we do not need quote pyramids to clog up the thread. As always, keep thing classy and be envious! The design was inspired by the F-22 Raptor. You can see the sharp Triangular edges and curves and the sliver Metallic look similar to the F-22 Raptor and a see through Plexi Glass making the fans visible. I like how the ASUS ROG Logo with Two Stripes which lights up on the back of the laptop and dotted lights on the bottom. Easily the best looking laptop on the market. So, far I am liking it despite it crashing 3 Dozen times while playing the BF3 (yes I upgraded to the latest drivers), nVidia drivers are just buggy. But despite that I am liking it so far. Beautiful 1080P IPS G-Sync monitor. Plays all the games I have maxed out at 1080P. I am back in the nVidia camp with regards to Gaming Laptops. I just hope that it lasts 6 - 7 years like my last AMD Gaming Laptop and NOT like my last 17" nVidia Gaming Laptop which died on me after two years due to nVidia's defective die packaging for that generation of nVidia GPU's which cost's me boat loads of money. I would swear to never by nVidia if this laptops GPU dies on me after spending boats loads of money on it and spending the extra premium for the 17" IPS G-Sync. I am willing to give nVidia a second chance despite the fact that they overcharge for their stuff. If anyone is on the market for a Gaming Laptop I would recommend the the Asus ROG G752VT and not the older Asus ROG, get the newer revamped design like the one I have. Has a pretty beefy bottom and back for the cooling. The highest I have seen the GPU go is 73 degrees Celsius for Gaming. @Xtasy26: That's an awesome laptop. Looks rather large and heavy though. I'm still running the same rig as before, but I did get an upgrade in internet service. Maybe not quite new "computer hardware", but it is part of my rig so...Boo yeah! 1Gbps internet! Great part is I pay less now with AT&T than I did with Spectrum's 60Mbps internet. This picture is slightly outdated, will update with a new one once I clean my desk. Left monitor is an Asus PG279Q (1440p, gsync, 165hz, extra BL bleed) and the right monitor is an old 1080p/144Hz display. The desktop has a 2600k @4.4Ghz, 32GB RAM, GTX 1080 FTW, and a few SSDs. Since this photo, I've moved the CRT to the closet and now have a 3D printer in its place. I'm also stepping up to a 1080Ti and later in the year I'll be switching out the 2600k for an 8 core CPU. Found a pic of the 3D printer to give an idea. Oh, nice. I'll put up a new picture of my entertainment center once my OLED arrives next week. I've got the big fancy speakers that used to be at my PC desk now located at my entertainment center, put on very spiffy-looking custom-made stands. @Stevo_the_gamer: It is large and heavy. It doesn't fit my old Laptop bag. But it seems to have better cooling and that is part of the reason the bottom back is heavy. Cooling is the most important thing in a gaming Laptop. So I am not complaining since I don't move it around often. I have since removed the 3.5inch hdd bay in front of the GPUs and mounted a 120mm on the front near the metal mesh. I'll need to clean up my space then I can post a new picture. The only change is the Siberia 800 though. Next up is a wireless mouse. Currently my set up looks like this. The case is a LD Cooling V8 which I have a little project going on with. Although I'm having a break in that now. Trying to sound proof it. About to say the same. When I bought a new desk, I got one that was 5 feet wide. It has OK amount of space. I've had it with Corsair PSUs. My 3rd in 6 years is on its way out. I HATE changing PSUs out, but I'm kind of excited about dropping down to 750. I almost went with the 650, but got a little nervous. The math all checks out, but who knows where GPU tech is gonna take us in the future? I know right, I'm planning to get a bigger one later down the line. That one should last you longer. 10 years warranty I think as well. What she looks like now. @KHAndAnime: Setup is looking great. I am jelly of the TV. However, I do find the TV base and stand somewhat distracting in terms of reflections. I am thinking the B7 would be better suited for me with the black base. @KHAndAnime: Setup is looking great. I am jelly of the TV. However, I do find the TV base and stand somewhat distracting in terms of reflections. I plan to do something about that. For now I'm okay with it but I can literally see cursor zipping around in the reflection of my desk and stand. It's not as bad as it looks in the pictures, I think the TV being so bright knocked off the contrast balance in the room. My room looks incredibly dark in that picture but I had all my lights on. I might replace that pic with a better one lol. I can barely even see my speakers in that pic for some reason. I plan to do something about that. For now I'm okay with it but I can literally see cursor zipping around in the reflection of my desk and stand. Maybe a matte black vinyl wrap would do the trick. Thanks, this reminded me to blow the dust out of my case. Antec 900 case, over 10 years old, broken power button, one fan starting to make a bit of noise, other than that, flawless. Since I pinched a nerve in my neck, I actually play more often from the living room pc, or the bedroom, just using steam in home streaming with a wireless xbox 360 controller. @joseph_mach: Wow, we get screwed hard in Canada for internet speed. Mostly because there's only really 2 players who dominate the market. I pay $90 per month (about $65 USD) for average speeds of 150 Mb/s, and mine is faster than most. @KHAndAnime: Looks nice. Beautiful OLED TV. 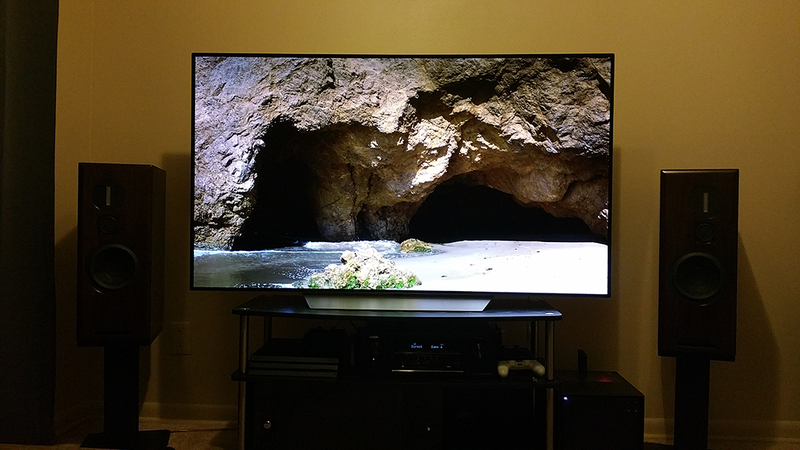 I have similar looking setup except with a 60" Samsung 1080P Plasma. Question? Do you game with a wireless mouse and keyboard? I am guessing that this your second PC? @horgen: Too many child processes typically overtax the system to the point of complete system shutdown. We're not intending to spawn any more! @ThereIs0nly0ne: great setup, pc gaming is a true art form from the design of the games to hardware setup to arranging the pieces to blend in with the décor of the home. I was tired of my Corsair H105 after 3 years and just to be safe and for fun decided to mix it up a bit. I had a brand new Cooler Master Hyper T4 laying around that I never got to use for another build I had planned. It's VERY similar to Cooler Master Hyper 212 EVO (even hard to tell apart). T4 Hyper came with two extra brackets for push-pull config which is exactly what I'll do in a bit. I'll probably switch a single fan for two RGB or red Tt Ring 120mm fans. It actually performs quiet well for a $25 - $30 cooler. Under full load (stress testing) it was only 3C or 4C higher than Corsair H105 temps. It's kinda funny how that works $100 cooler performs pretty much the same as $25 - $30 one. Mahhh... decided to slap another fan on for now... now temps are on par with Corsair H105. Thank you - appreciate the comment! Hmm... As much as I like the Siberia 800. They aren't quiet. Low pulsing beeping noise whenever they are turned on. @gravityflow2791: Congrats on your first gaming rig. Looks good. Welcome to the PCMR. A quiet rig I suppose. ? Yeah it was. I got a simple rig here, only an i3 running and no GPU. Could probably do without a fan on the CPU heatsink. It's rather quiet as well. @horgen: i too had an i3 6100 with stock cooler but used to get a little noisy to my liking. Actually they offered me the H55 at a very cheap price while buying the i5, so i couldn't resist :P.
I got the CM Hyper 212(evo?) cooling it. @gravityflow2791: Congrats on your first build, looks like a nice little build. Although you should have saved another $30 or so and got the 6GB version of GTX 1060. If you play @ 1080p then yes GTX 1070 will most definitely max out all of your games. Although in 6 months we'll probably hear some news about Volta.